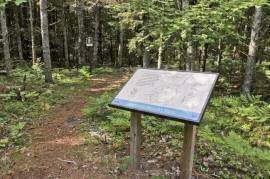 This hard-packed, easily accessible trail is .9 miles in length and takes the visitor through a 200 year old hemlock forest on the shore of Little Bay de Noc. Because of its geographic setting, the area was a focal point of human activity and includes Native American sites and the foundations of an old resort hotel complex. Abundant historic photographs and oral history quotations on interpretive signs tell the Maywood story. From Rapid River drive 2.4 miles east on US-2 to County Road 513. Turn right (southwest) on jCR513 and drive 5.5 miles to the campground road. Drive about .8 mile on the campground road and turn right on the road that accesses the group camp sites (15 & 16). The trailhead is on the right.